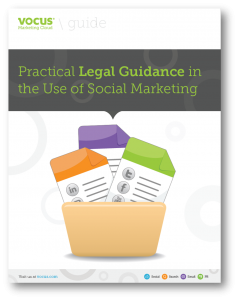 Top 10 legal pitfalls to avoid in social marketing! In the past, marketing managers used social media as just another channel for publishing content and listening to their community. However, to maximize the success of social marketing, you need to become adept at integrating social media into your existing marketing programs and strategies. In fact, you have to do more than social media. You have to do social marketing! Increasingly, marketing managers are exploring new ways to use a variety of channels in order to reach audiences with compelling content. Perhaps what many don’t realise is that there new rules and regulations that have an impact on how this can be done and this is an area where many marketing professionals may have a knowledge gap. These are my Top 10 legal pitfalls to avoid when thinking about using social marketing. No matter whether you work agency or client-side, each day or week brings new challenges in how you engage with customers, clients, supporters, members and volunteers. In the past, social media was used as just another channel for publishing content that would engage with each of these audiences. But today, doing that alone just isn’t enough. To maximise the success of social marketing you need to become adept at integrating social media into your existing marketing programmes and strategies. In fact, you have to do more than social media. You have to do social marketing! The International Olympic Committee (IOC) decision to award Tokyo, Japan the right to host the 2020 Summer Olympic Games has benefits for Japan beyond economic and sporting opportunities. Fuelled by the city’s dynamic atmosphere and youth-driven culture, the successful bid to host the 2020 Summer Olympic Games in Tokyo, Japan will have an important role to play in the healing process of Japan following the national earthquake tragedy in 2011. As I explained in my latest report, ‘Global Opportunities for sports marketing, infrastructure and consultancy services 2022′, published by IMR, over the next few years, Japan will host the 2014 ISU World Figure Skating Championships, the 2014 World Table Tennis Championships, the 2017 Asian Winter Games and the 2019 IRB Rugby World Cup. It may not be obvious, but the world of rock ‘n’ roll knows a lot more about how to connect with consumers in a powerful way than many multi-national companies with multi-million budgets to match, a point I make in my latest book, The Art of Influencing and Selling. And I don’t mean by connecting with consumers through iTunes and the mobile internet, although of course that’s a proven way of reaching music fans. What I want to talk about is about ‘rendering authenticity’ in order to connect with the next generation of consumers and fans.